So that was May! A strange mix of my fiftieth birthday (which was a joy) and a horrible chest infection. Being ill for the last ten days has meant extra reading time though – and looking down the list of things I read, it was a pretty good month. The month started really well with Delta Wedding by Eudora Welty, my second try at Welty which was much more successful. A slow, evocative read with a stunning sense of place. The Hothouse by the East River by Muriel Spark for #ReadingMuriel2018 was a strange surreal little book, but one I really enjoyed. Set in New York in the late 60s/early 70s it really shows Spark’s inventiveness. Having loved the Durrell TV series, I was eager to read Whatever happened to Margo by Margaret Durrell, it underwhelmed a little to be honest, and certainly it lacks the humorous brilliance of Gerald Durrell’s books, but it was entertaining enough. The Cat’s Cradle Book by Sylvia Townsend Warner is a gorgeous little collection of unusual stories, telling us the traditional stories passed on by adult cats to their kittens. Perhaps only STW could write in such a way, and make it work like she does. I always enjoy finding a new to me author, and Ellen Foster, Kaye Gibbons’ debut novel was my first by an author I knew nothing about. I have another of her books to look forward to and a couple of commenters filled me in about her and her other books. The Honours Board by Patricia Hansford Johnson is a school set book for adults, and I know there are a lot of readers who enjoy those. This is another excellent novel from PHJ, who deftly weaves together the various stories of the men and women who live and work at an English preparatory school. Writers as Readers the anthology of VMC introductions is a book I am sure I shall return to again, a wonderful collection of VMC voices I very much enjoyed dipping in and out. My fifth book from the Asymptote book club was Brother in Ice by Alicia Kopf one of several books I still have to review. It is a book I wasn’t sure I would like, but I did. It is a difficult book to describe, genre defying, it is part novel, part travelogue part research notes. Using stories of polar exploration, it is also the coming of age story of a young woman concerned about her older autistic brother. Book two of the MaddAddam trilogy The Year of the Flood by Margaret Atwood kept me fabulous company as my chest infection really hit. The story in this book runs parallel to that of the one in Oryx and Crake, and in it we see again Atwood’s astonishing imagination. Next, I read The Elected Member by Bernice Rubens for Shiny new books Golden Booker celebration, so the review will most likely appear there first – though not for a few weeks. I loved it, isn’t it wonderful when a book you have had tbr for an absolute age turn out to be so brilliant you wonder why it took you so long? On a whim really, I chose to read My Wife Melissa by Frances Durbridge on my kindle – one of a number of Bello books I splurged out on a couple of years ago. I quite enjoyed it – though it did seem to be over almost as soon as it had begun. The story itself is entertaining, but for me there is nothing in the way of character development or setting description to lift it above the ordinary. Yesterday afternoon I finished Tory Heaven by Marghanita Laski, which I only began on Wednesday evening. The mini Persephone readathon begins today, so despite having other things waiting to review, I shall review out of order and try and get this one reviewed by the end of the weekend. It is a sharply observed satire and a scathing indictment on the social hierarchy of the class system. As well as all the above, I have read some of Grace Paley’s short stories in the new VMC edition of the Collected Stories. More about that in the coming weeks, as I continue to dip in and out. I have just started The Carlyles At Home by Thea Holm – Persephone book 32 – it is about the lives of Jane and Thomas Carlyle when they lived at Cheyne row, Chelsea. I may stray away from my ACOB to read another Persephone book this weekend too, I shall see how I feel and what time I have. I shall of course continue with those Grace Paley stories and I am looking forward to The Takeover by Muriel Spark for #ReadingMuriel2018. Whatever you’re reading in June I hope you enjoy it, and as always I would love to know about the best things you read during May. Posting this May roundup, a day late as I had to make way for my Elizabeth Taylor giveaway yesterday. Well May was a funny old month. I haven’t been a hundred percent – and although I am pretty much back to full strength now, I found myself signed off work. Forced into more reading time, and feeling pretty grumpy, I immediately spent untold hours retreating into Netflix. I did read more than I usually do – though nothing like as many books as I could have done. I started May reading Effi Briest by Theador Fontane, one of the latest Persephone titles, it is a German classic which unusually for Persephone publications is already in print in other editions. It is a novel which really should sit alongside such classics as Anna Karenina and Madame Bovary – it was a wonderful read. – but will they get away with it. My next read Slaves of the Lamp by Pamela Frankau, sporting a pretty dreadful 1960s cover – was the sequel to Sing for your Supper which I read a few months ago. More superb characterisation from Frankau, as she weaves together stories of theatrical people with those of advertising and the world of spiritualism. The Librarything Virago group were reading Willa Cather during May, and I chose The Professor’s House as it was the last of her novels I had to read. It is brilliant novel, quietly introspective, it tells the story of a mid-western university professor and the brilliant student who is never far from his thoughts. Since reading My Name is Lucy Barton, I had been meaning to read more by Elizabeth Strout. I enjoyed Olive Kitteridge even more, the structure is more of linked short stories and the writing is utterly brilliant. A Far Cry from Kensington by Muriel Spark is quite a quirky little novel, there is a hint of darkness perhaps – but the novel heighted for me what an interesting writer Muriel Spark is. Nina Bawden is one of those writers I reach pretty much knowing I am going like, maybe even love what I find. A Little Love, A little learning is a particularly good Bawden, she is at her best I think when she is writing about families. The Talented Mr Ripley by Patricia Highsmith is the book of a film I watched a long time ago – of course the book is better – is also the first in a series of five. In Ripley, Highsmith created an enduringly fascinating character. The third book in the Balkan trilogy, Friends and Heroes by Olivia Manning brought that compelling trilogy to a fantastic ending. I am now looking forward to the Levant trilogy. A Note in Music by Rosamond Lehmann, was a book I had wanted to read for years. It absolutely didn’t disappoint – her second novel about the disappointments within marriage it written in the most glorious prose. My very small book group chose to read The Handmaid’s Tale by Margaret Atwood, although we don’t meet to discuss it until the week after next. I first read it somewhere between about 1987 (when my edition came out) and the early 1990s and although I had forgotten many of the details – the essence of it had stayed with me. I was simply blown away by it, and gulped it down in two days. Earth and High Heaven by Gwethalyn Graham was my final book completed in May. It is the second of the two books reissued by Persephone in April. I can’t adequately express how much I loved this novel. A Canadian novel which tells the story of a young woman who falls in love with a Jewish man, and her father’s horrendous anti-Semitic attitude. It is a definite contender for my best of list at the end of the year. Those two final novels of course I still need to review – but I may have a breather for a couple of days as I have been churning out blog posts this week. After finishing Earth and High Heaven I reached for an Anita Brookner novel, Family and Friends, most of which I did read during May but I actually finished it over breakfast on June 1st so it can go at the bottom of June’s pile. And so to June. The Librarything author of the month for June is Margaret Laurence – and I am hoping to get around to The Stone Angel. She is an author I have never read before. Having dispensed with that Anita Brookner – which was very good I have just started reading Mrs Eckdorf in O’Neill’s Hotel by William Trevor I really should have read more of his books than I have. 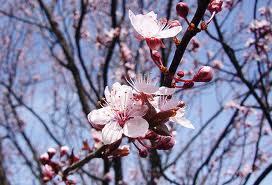 May is one of my favourite months, a month of blossom, lighter evenings, bank holidays and my birthday. This year of course May culminated in me spending a couple of days at the Hay Festival – which I blogged about yesterday. I have also read a mix of excellent books. 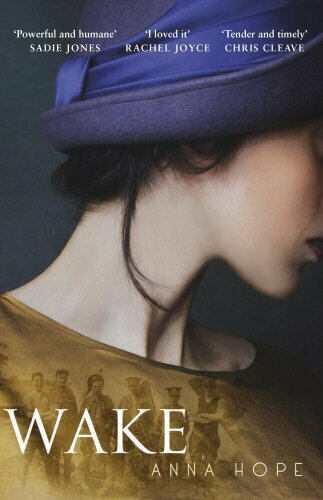 I began May reading a Pat Barker novel have had for ages, Liza’s England is the story of a working class woman – the same age as the century she lives in. It is a wonderful story of more than eighty years of history – and a woman who lives through those changing times. Mrs Dalloway’s Party was the collection of stories that I chose to begin phase three of #Woolfalong – I loved how it complements the novel Mrs Dalloway. The Days of Abandonment by Elena Ferrante– was a book group read which really packs a punch, a viscerally angry novel, I was surprised by the tone of the book but ended up really loving it. Parson Austen’s Daughter by Helen Ashton, was a Christmas present from my sister, the fourth Helen Ashton I have read – I liked it but it is my least favourite of her books so far. The Testament of Vida Tremayne by Sarah Vincent was kindly sent to me by the author, in it we have a compelling mother, daughter story set in the countryside of the Welsh borders. Willa Cather’s Lucy Gayheart – was my top read of the month, a story of love, loss and failure it’s deeply poignant, reminding me that Willa Cather is one of my favourite writers. Next two review copies back to back – they’re like buses sometimes – He Runs the Moon an excellent collection of short stories subtitled tales from the cities by Wendy Brandmark, Summer an anthology of writings, includes extracts from well-known novels, essays from some (to me at least) new voices, and poetry. I will be reviewing Summer soon, although I think an anthology will be even harder to review than I find short stories to review. Red Dust Road by Jackie Kay – read on my kindle for my book group – a couple of weeks early to make way for #20booksofsummer – is the compelling story of the poet’s search for her birth parents. I ended the month by reading – in a day – the short novel – La Femme Gilles by Madeline Bourdouxhe. I had only read a review of it a few days ago – I ordered it immediately and began reading it straight from the packaging on arriving home from Hay. Beautiful and devastating I want to read everything by this Belgian writer who is being re- issued by Daunt books who do produce such elegant books. So June is the beginning of #20booksofsummer – and I chose thirty books in which to read twenty from – which I hope will help me stick to the pile. Beryl Bainbridge week is not far away and I have two Bainbridge on that summer reading pile – A Weekend with Claude and A Quiet Life. 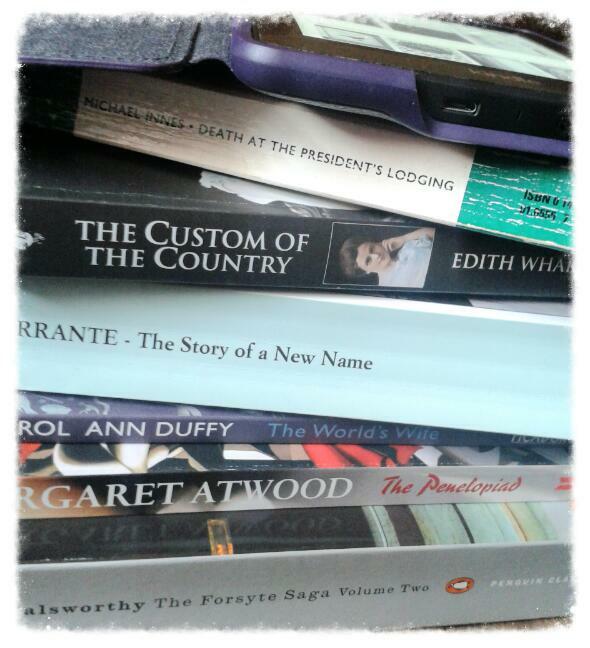 I also have more Virginia Woolf stories to read, Monday or Tuesday will be up soon. As for everything else I think I pick from that summer pile according to my mood. My last two posts have not been reviews – and I have three books to still tell you all about. I will get back to reviewing in a couple of days. 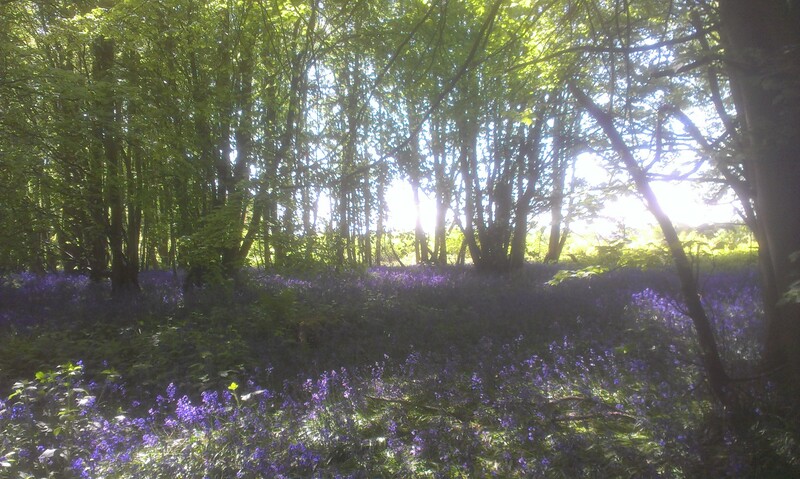 May in review and some eleventh hour Sylvia Townsend Warner. I began May a little way into a lovely Persephone book, The Young Pretenders by Edith Henrietta Fowler which I absolutely loved – originally a book for children at the end of the nineteenth century, it had me shedding a tear or two. That was followed up with The Story of a new name by Elena Ferrante, an absolutely brilliant follow up to My Brilliant Friend. I chose to read The Custom of the Country for #Whartonreview which has been hosted by Brona’s books this month, it was a wonderful read, and I loved every word. Death at the President’s Lodging by Michael Innes was a complex academic mystery, the first novel in Michael Innes Inspector Appleby series. The White Monkey, book four of the nine books of The Forsyte Saga Chronicles, was fabulously readable and I thoroughly enjoyed catching up with Soames and Fleur in 1922 a time of social and political change. It was fitting I should have been reading it around the time of our General Election. A Sea-Grape Tree (accidently left out of the pictures) was Rosamond Lehmann’s final published novel, coming after quite a lengthy literary silence, it is also the sequel to her masterly 1944 novel The Ballad and The Source, it is a slightly odd little novel, but overall I liked it. Next came a re-read – a book I really don’t know why I haven’t re-read before – the utterly perfect To Kill a Mockingbird, I loved it so much I didn’t want the book to end. Next I caught up with two book group reads with a wonderful collection of poetry The World’s Wife by Carol Ann Duffy and Margaret Atwood’s re-telling of the story of Odysseus; The Penelopiad. I finished the month with a wonderful early Mary Hocking novel A Time of War – preparing as I was for Mary Hocking week, and some lovely short stories (see below) and continued my reading of All Day Long by Joanna Biggs – which I haven’t managed to finish yet – I’m about half way through – it is brilliant actually but I keep being distracted by other things. 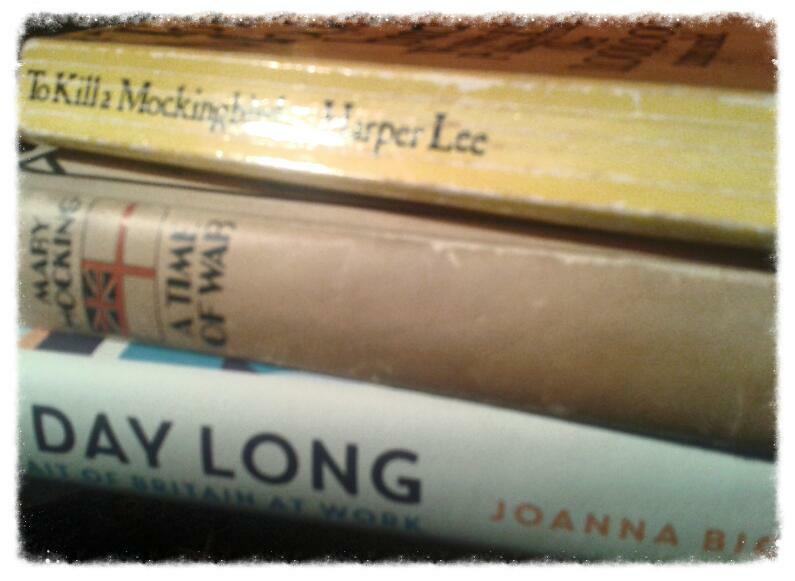 So on to June, next week is all about Mary Hocking reading week for me, and I hope some of you will be joining me. I will be reading the sequel to A Time of War, The Hopeful Traveller. 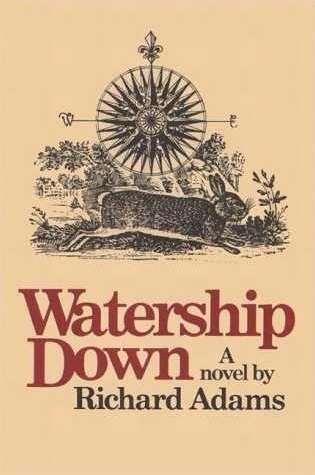 As for the rest of the month, I don’t have many definite plans although I am supposed to be re-reading Watership Down toward the end of the month for a book group. Some of you may have been aware of a Sylvia Townsend Warner reading week that has been happening in some corners of the internet this last week– mainly on Facebook I think, which I had wanted very much to join in. I realised last weekend though that I wouldn’t be able to fit an STW novel in to a week which saw me catching up with book group reads and preparing for Mary Hocking reading week. However yesterday afternoon I did manage to read two lovely Sylvia Townsend Warner short stories from a wonderful collection called Wave me Goodbye, which is published in an omnibus edition with Hearts Undefeated – this is a book absolutely crammed with the voices of the women writers I love. I will be dipping into this collection more and more I think now that I have whetted my appetite. Sweathearts and Wives – tells the story of the inhabitants of Badger Cottage. Married young in 1940, Justina and Midge, decided to throw their lot in together while their husbands are away fighting. Midge has a baby Lettice which absolves her from conscription, while Justina has taken over the work of an auctioneer’s clerk. Into this house come the Sheridans, bombed out of Mitcham, Mr Sheridan away at the war (except when on leave) three children, an Alsation dog and a horse called Shirley. Poor Mary – is a more sombre story. Mary is the wife of Nicholas, a conscientious Objector who has spent the years since his exemption working on a farm. Mary had joined the ATS – their views on war differed rather. Their differences had led to their separation. Now, having not seen one another for four years, Mary has come to spend her leave visiting him at the tiny farm cottage where he lives. Both of them feel awkward, they have both changed; the war is nearly over, they each to re-adjust their view of the other. 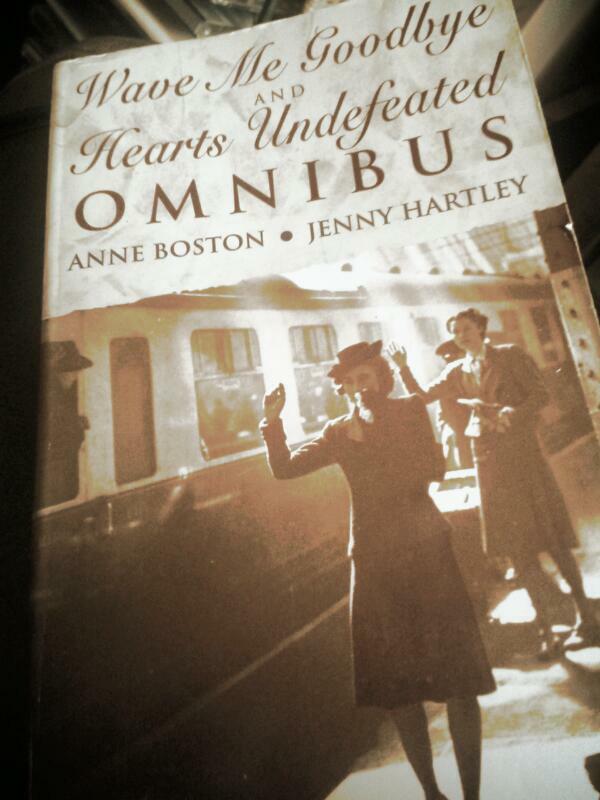 In the second section of this omnibus made up of non-fiction pieces, extracts from essays diary entries etc. were three extracts from Sylvia Townsend Warner’s letters here entitled; Bombs in the Country, The New Austerity and The Censor . These I read in just fifteen minutes, and they are wonderfully engaging and humorous. Some pieces in this collection are tiny just a paragraph or two – while others run to a few pages, part of me wants to gobble up the whole volume – which is quite chunky – now that I have dipped into it, don’t be surprised if this volume is referred to again and again as time goes on. All in all it’s been a pretty excellent month, so what have you been reading? At the end of last month I was complaining that I have been reading slowly this year, having so far read fewer books than at a similar point in previous years, and this despite my to be read bookcase being fuller than ever. Well it looks like I will just have to accept the fact that I am reading slower in my old age, it irritates me though as I have so much waiting to read, and don’t know why it has happened. This month I have read just 9 books – although they were all excellent and after all that is more important. I started and finished the month with a book from my classic club list, and in-between read a couple of fantastic new books, a book for the Edith Wharton reading month hosted by Brona’s books and another book for the Great War theme read. If the quality of what I’m reading remains as high as it has been this month then I will be happy. I have still to review A Changed Man – my final read for the Thomas Hardy reading project which I and some friends embarked upon almost three years ago. Look out for a post about that project on Monday – if you are a Hardy hater feel free to ignore. 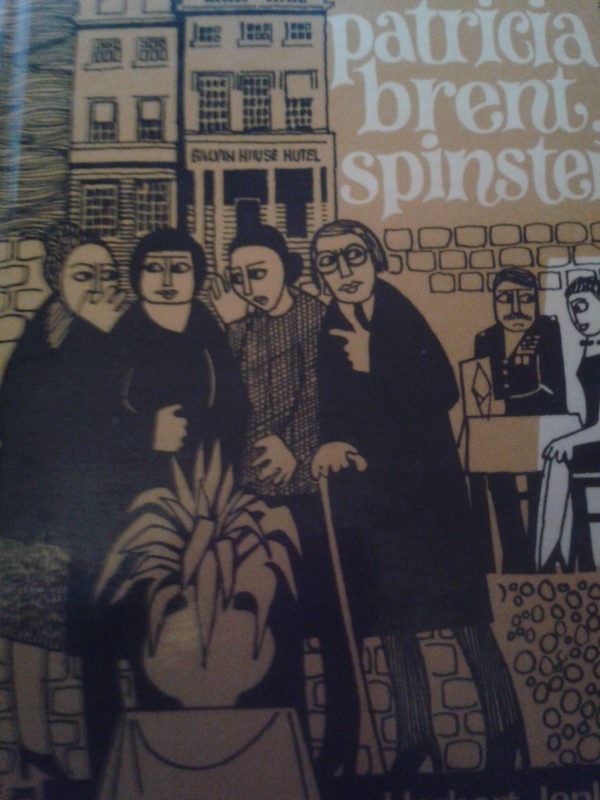 1 Patricia Brent, Spinster by Herbert Jenkins; oh such a sweet little book, not too serious perhaps but I loved it. 2 Wake by Anna Hope; such a wonderful novel, it deserves to do really well, which I’m pretty sure it already has. 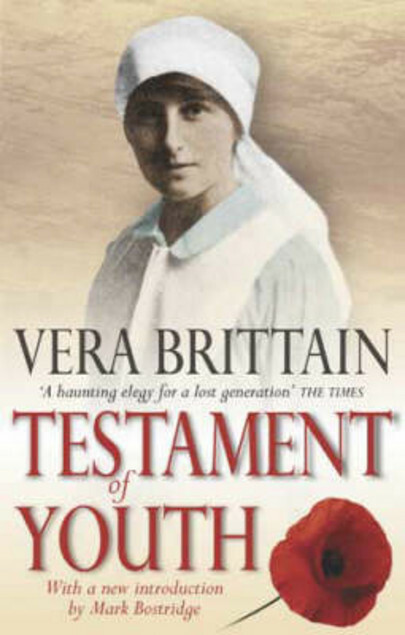 3 Testament of Youth by Vera Brittain; a tome of over 600 pages, but a seriously remarkable autobiography. So on to June – a busy time coming up at work, and tired doesn’t even begin to describe how I’m feeling, despite a short half term and a week off. Actually my stress levels at work have been a little raised this last few months – and I’m not even a teacher! You have probably seen me banging on fairly remorselessly about Mary Hocking just lately – and I have declared June to be Mary Hocking reading month – you can find out why here. 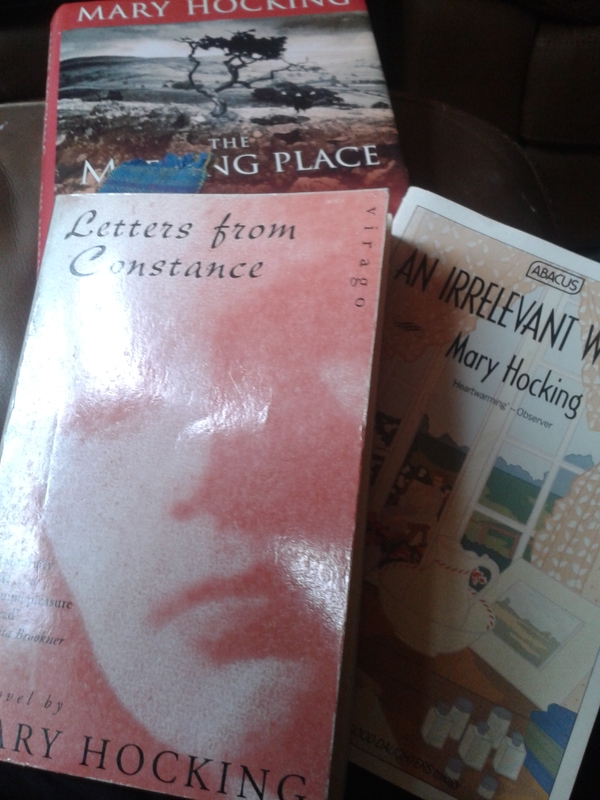 I have already started my first Mary Hocking book, so technically at least half of Letters from Constance could probably be tagged on to the end of the above list – but no matter. I would love lots of people to join in with this reading month – and try to raise the profile of a lovely writer whose books have so undeservedly fallen out of print. It is difficult raising the profile however of someone so few people have heard of. Someone on Twitter contacted me to say they had been let down by an online book seller and couldn’t find her books in the library so might now not be able to join in – how sad! 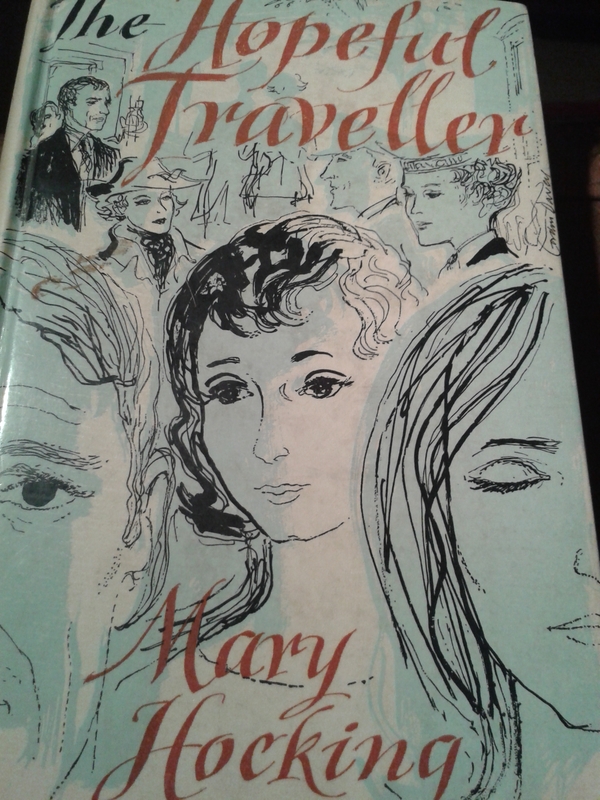 By the way if you are on Twitter please use the hashtag #rememberMary if you are reading or talking about her books. I have three Mary Hocking books waiting to be read, but given my rubbish reading rates – I can’t promise I’ll get to them all – but I am going to try – I do have a couple of lovely looking review copies to read and my next Anthony Powell is already calling me. What are you all planning to read? Whatever it is I hope you have a great reading month in June. May reads – and looking forward to June. My reading for May has had a birthday theme, and I think this may become an annual event. My own birthday was on the 13th of May, a birth date I share with Daphne Du Maurier. So for almost the whole month I read books only by authors who were also born in May. This I called my birthday reading challenge – but really it wasn’t much of a challenge – as challenge suggests something that might be difficult – but in fact this was really quite a joy. 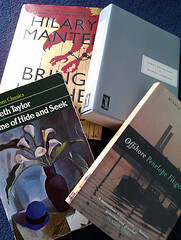 All my May babies books were really excellent but the standout books for the month would be The Pat Barker novels Life Class and Toby’s Room, and the Daphne Du Maurier books My Cousin Rachel and Jamaica Inn, another quiet little joy was William Trevor’s ‘Love and Summer’. Having read ten books by May babies – I finished my month of birthday reading a few days early so I could read my next Hardy book and my librarything early reviewers book before June’s Pym reading week got under way. Which makes twelve book in all for May – all of them fiction – my non-fiction reading has been even worse than usual this year. I have some great things coming up in June. 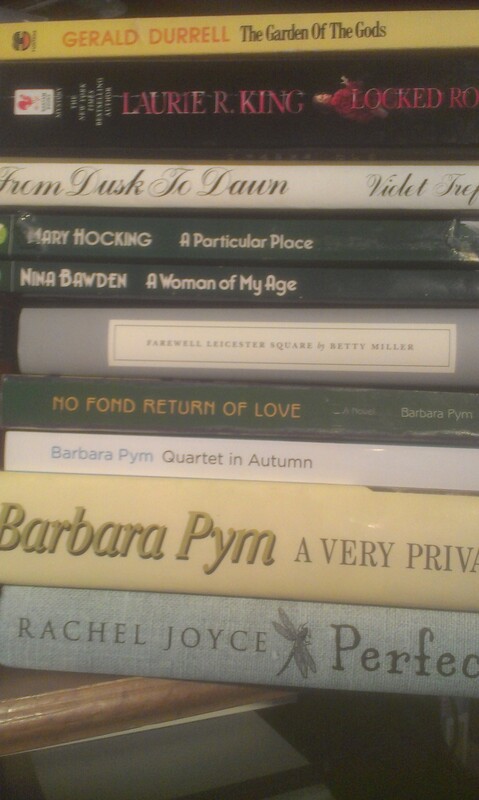 The Barbara Pym reading week is first on the agenda – and I am planning on reading ‘No Fond Return of Love’ and ‘A very Private Eye’ for that, moving on to A Quartet in Autumn later in the month. I also have my classic club spin book ‘Farewell Leicester Square’ to read, which I have heard good things off. Karen at Kaggysbookishramblings and Simon at Stuck in a book were reading ‘A Woman of My Age’ during May and I so wanted to join in, and fellow librarything member Elaine delighted me by sending me a copy – so although I’m a little late to the party I intend to read it this month. I also have a lovely proof copy of Rachel Joyce’s ‘Perfect’ to read – I’ll be reading and reviewing it at the end of the month – it’s published at the beginning of July. I’ve also added three books to my June pile that I have had TBR for ages, and another Virago book I have wanted to read for a while. All in all there’s a good pile there – and look, two non-fiction! 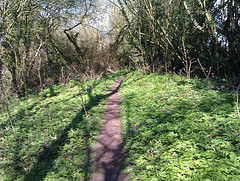 This photo was taken on one of my rambles with the Birmingham rambling group I regulary walk with. Nothing to do with books – but walking is my other love – and I always have a good read on the coach travelling to and from the places we walk in. This picture wasn’t actually taken in May – but never mind. During May I read 10 books – fewer than last month – but some great ones among them. Here’s the list. 1. Family Roundabout – Richmal Crompton – a beautiful Persephone book about two families between the wars. 3. Bring Up the Bodies – Hilary Mantel – fabulous sequel to Wolf Hall.